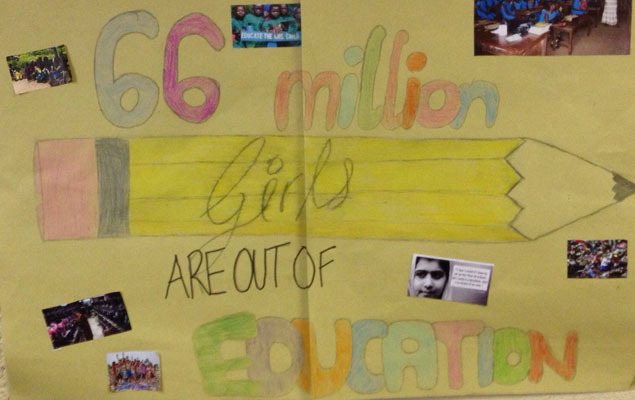 66 million girls in the world are out of education and there are 33 million fewer girls than boys in primary school. We realise how important an education is, and of the need to extend it particularly to girls in developing countries, as this empowers and enables them to build a better future for themselves and their children. A girl with an extra year of education can earn 20% more as an adult, and this has a knock-on effect to the lives and futures of individual girls, their communities and the way that societies function and view women. Furthermore, the low number of female teachers contributes to the low number of girls in school in rural areas of developing countries. Girls will also benefit from having role models of independent women in their lives and it will be an impetus for them to pursue their own careers. For these reasons, we feel that educating girls is an important issue. Millennium Development Goal Number 2 is to Achieve Universal Primary Education by 2015, and last month Minister Costello announced funding of €4.6 million to UN Women, to support programs and policies that help empower women and girls. We applaud the Irish Government for this and as this is such an important issue, we would urge you to continue to work with your UN and EU counterparts in order to give more urgency to the issue of girls in education, so that Millennium Development Goal Number 2 can be met. Minister Gilmore, you yourself even addressed the UN General Assembly on September 25th 2013 about the need to agree on a new set of measurable, global goals, with a clear commitment to implement them at a national level. As you said, we cannot eradicate poverty without genuinely empowering women and girls. We firmly believe education is the best way to do this. Change can only happen if influence is exerted by wealthy, developed countries such as Ireland, and we therefore strongly urge you to take action and encourage support for the many movements for change for girls in education globally. So that girls across the globe can move closer to living in an equal world, we strongly urge you to explicitly address the pressing issue of girls in education at your European meetings and conferences in the coming months and to demonstrate with our partners both in developing countries and in the developed world that real actions are being taken to promote effective change.